Pour enough milk in the dinner plate to completely cover the bottom to the depth of about 1/4 inch. Allow the milk to settle. 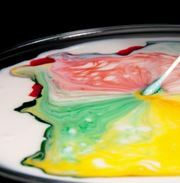 Add one drop of each of the four colours of food colouring – red, yellow, blue, and green – to the milk. Keep the drops close together in the centre of the plate of milk. Find a clean cotton swab for the next part of the experiment. Predict what will happen when you touch the tip of the cotton swab to the centre of the milk. It’s important not to stir the mix. Just touch it with the tip of the cotton swab. Go ahead and try it. Did anything happen? Now place a drop of liquid dish soap on the other end of the cotton swab. Place the soapy end of the cotton swab back in the middle of the milk and hold it there for 10 to 15 seconds. Look at that burst of colour! Add another drop of soap to the tip of the cotton swab and try it again. Experiment with placing the cotton swab at different places in the milk. Notice that the colours in the milk continue to move even when the cotton swab is removed. What makes the food colouring in the milk move? Milk is mostly water but it also contains vitamins, minerals, proteins, and tiny droplets of fat suspended in solution. Fats and proteins are sensitive to changes in the surrounding solution (the milk). The secret of the bursting colours is the chemistry of that tiny drop of soap. Dish soap, because of its bipolar characteristics (nonpolar on one end and polar on the other), weakens the chemical bonds that hold the proteins and fats in solution. The soap’s polar, or hydrophilic (water-loving), end dissolves in water, and its hydrophobic (water-fearing) end attaches to a fat globule in the milk. This is when the fun begins. The molecules of fat bend, roll, twist, and contort in all directions as the soap molecules race around to join up with the fat molecules. During all of this fat molecule gymnastics, the food colouring molecules are bumped and shoved everywhere, providing an easy way to observe all the invisible activity. As the soap becomes evenly mixed with the milk, the action slows down and eventually stops. Try adding another drop of soap to see if there’s any more movement. If so, you discovered there are still more fat molecules that haven’t found a partner at the big colour dance. Add another drop of soap to start the process again. The Colour Changing Milk activity is a great demonstration of what happens when you combine dish soap and milk. But it’s just that… a demonstration. How can you make this colourful and engaging activity a good science fair project? Change something, create a new experiment, and compare the results. Repeat the experiment using water in place of milk. Will you get the same eruption of colour? Why or why not? What kind of milk produces the best swirling of colour: skim, 1%, 2%, whole milk, cream? Does the fat content of the milk affect the reaction? The dish soap must remain the same in the experiment. Use the same brand for each trial and the same amount of soap. Use the same colours and the same amount of food colouring in each trial. Pour the same amount of liquid into the bottom of the dish. All of these steps ensure that you have standardized the conditions as much as possible and have isolated a variable–the one thing that changes in the experiment. In this case, the variable is the type of milk you are using. Take photos of the reactions (maybe even videotape the reactions) to document your discoveries and share at the science fair. via Color Changing Milk | Experiments | Steve Spangler Science. This entry was posted in Gr 1-3 Science & Tech, Gr 4-6 Science & Tech, Gr 9-10 Science, Gr. 11-12 Chemistry and tagged activity, controlled experiment, variable, water. Bookmark the permalink. THANK YOU !!!!! you just saved 5 students’ chemistry scores..
You’re most welcome. I’m glad your students found the post useful. This activity is a great example of complex chemistry in such a simple and fun activity.